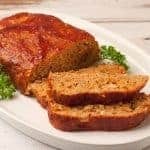 Made with ground chicken and all the ingredients of a homemade barbecue sauce, this meatloaf is a lighter, flavorful change from traditional recipes. Preheat the oven to 350°F and coat a shallow baking pan with nonstick spray. Place the ground chicken, egg, breadcrumbs, onion, garlic, tomato paste, brown sugar, Worcestershire sauce, mustard, vinegar and smoked paprika in a large mixing bowl. Add 1 teaspoon salt and a few grinds of black pepper and combine thoroughly. Turn the mixture onto the prepared pan and form into a uniform loaf. Bake uncovered for 30 minutes. Make the topping by combining the ketchup, Worcestershire and apple cider vinegar in a small bowl. Remove the meatloaf from the oven and spread the topping evenly over the top. Continue baking the meatloaf for an additional 10 to 15 minutes, or until a thermometer inserted into the center registers 165°F. This meatloaf can easily be made with ground beef, pork or turkey as well.